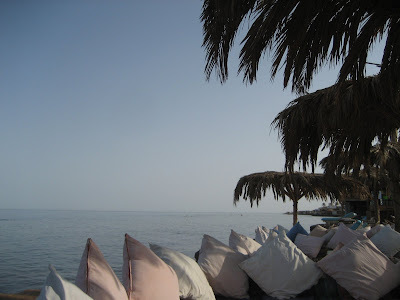 When I first arrived in Dahab I had a bit of a hard time relaxing. "So instead of constantly walking and seeing sites, I'm just supposed sit here on this beach all day drinking fresh squeezed juices and beer?" How very foriegn. It wasn't until ran into a Kiwi couple that I started to relax. They unknowingly captured the spirit of Dahab. "We used to start at one end of the restaurant and move every few hours over to the next cushioned seating area so that we could stay in the sun. It was too much work, so now we just stay on these cushions all day" I take a deep breath, stop worrying about the world class diving that I should probably be experiencing, and take another sip of my beer. Sure I have to kick in my door each time I enter my hostel room, and yes at the count of twenty I stopped trying to total the amount of flies that had landed in my honey during breakfast. There is, however, no denying Dahab's paradise status when you're sitting on pillows around the fire at night looking towards the glimering lights of Saudi Arabia just across the calm waters of the Red Sea. Eat me some Kushari and Fool, fool!